If you know someone that cares a great deal about their appearance and is always seeking out the latest fashions and accessories, pay tribute to them with a customized fashion bobble head doll. We’ve got male and female fashion bobbleheads that are wearing all kinds of fashionable garments and sporting all kinds of fashionable accessories. Customized in someone’s image, these make truly unique and memorable gifts. We have one of the largest collections you’re likely to find of customizable fashion bobble head dolls. These make perfect gifts for someone who is always on top of the latest fashion fads and trends. 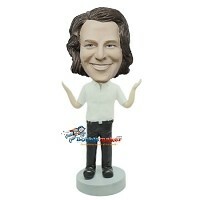 With an image that you provide, we can customize the bobble head doll to look like the person that you want it too. That’s why these are perfect gifts for any occasion, including birthdays and Christmas.